…for kid’s clothes…in this case, mine. So this is for ScrapFriends Yummy Scrap #20. Traditional Christmas colors, but I went for a non-holiday theme. 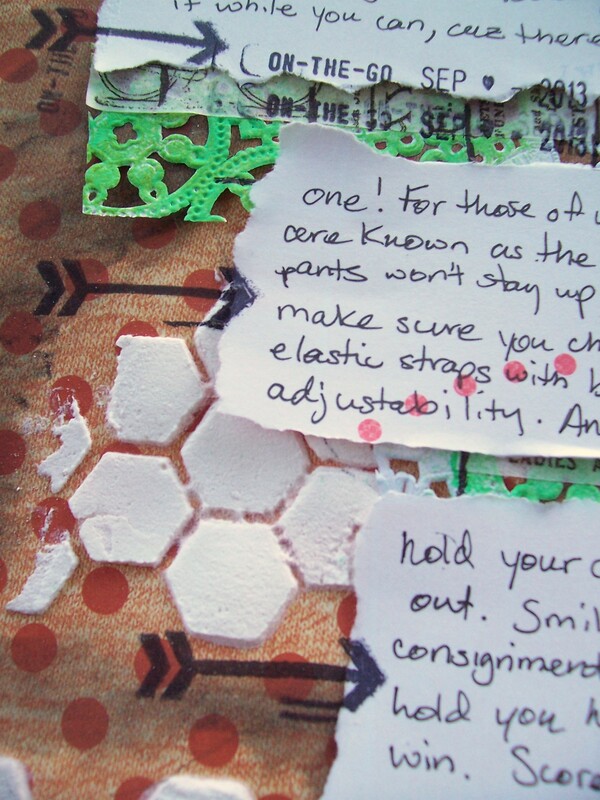 The background paper is Amy Tangerine, as are some of the paper layers (black chevron, green dot), and some of the die-cuts (the hanger and clothespin). 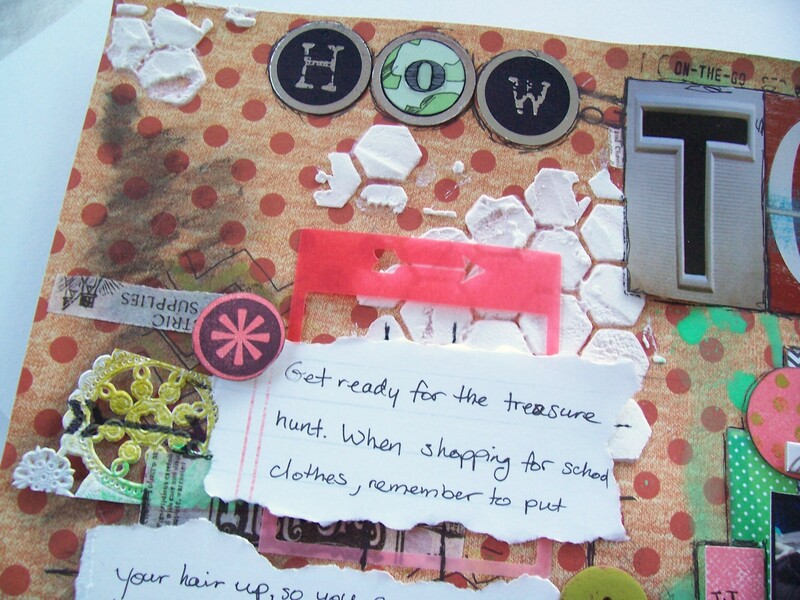 I used a spinner and gear from Tim Holtz, We R Memory Keepers White Out papers (the pale red), and DCWV Rock Star and Tattered Time pack (dark green, peeking out by “TREASURE HUNT”, and the “gear” layer above that). For the background, I did some green paint drips, and borrowed a technique from another lovely scrapper, Riikka Kovasin, with using leftover letters stickers and gesso on your background. For me, I used blue letters stickers and painted over them with green paint. The I added some borders of ribbon and stickers, as well as a piece of cardboard that I tore the top layer off to reveal the wavy part underneath, then painted it white. You may also see the homemade texture paste that I put through a Heidi Swapp honeycomb stencil, as well as gray watercolor crayon that I blended with a baby wipe for some extra texture. 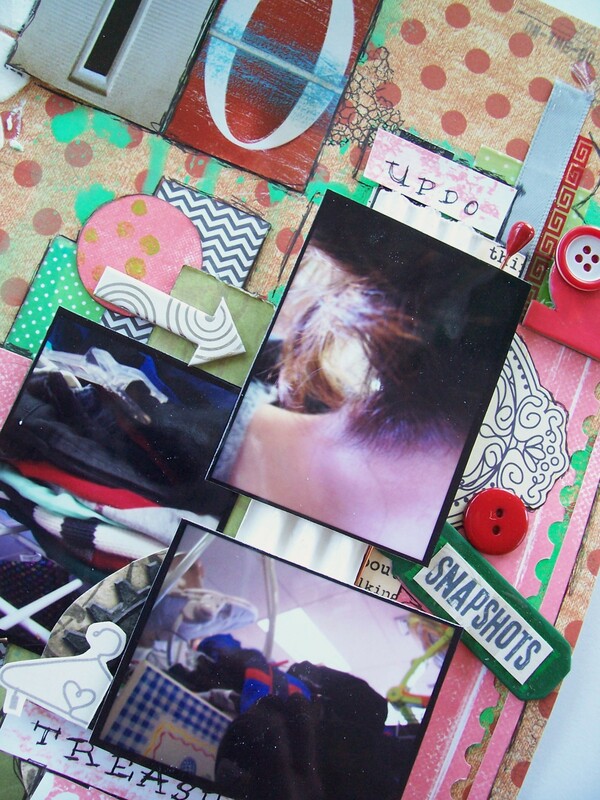 The red chipboard tab and green “SNAPSHOTS” tags were colored with paint before I adhered the embellishments. 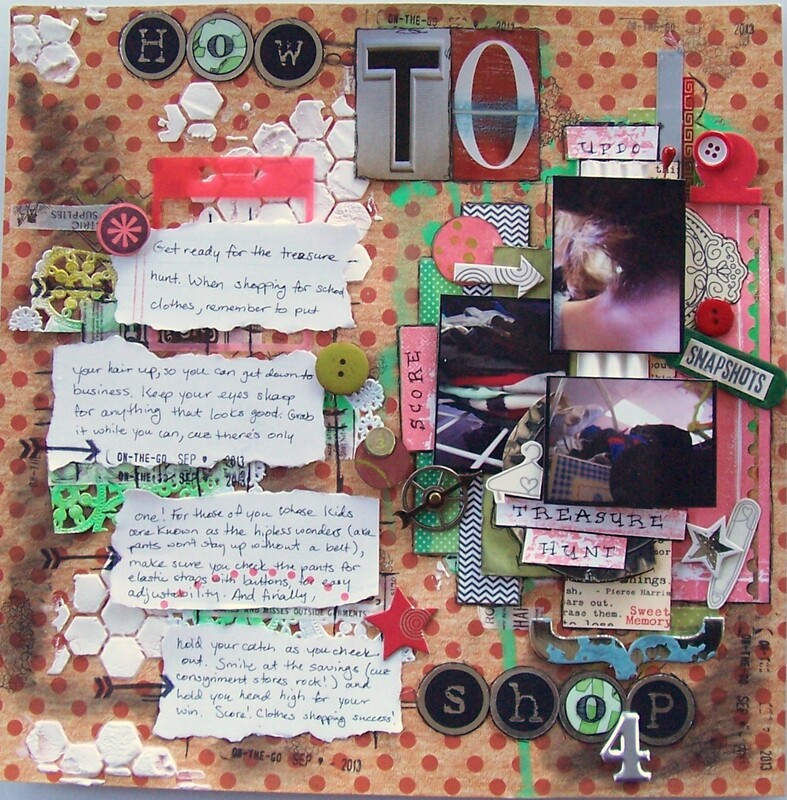 There some other chipboard from the same st, and a few more buttons. I had been experimenting with different mediums and shades of green on a large paper doily. After some figuring, I cut some of it into strips, and placed them down, with 7Gypsies paper tape in between. Then I took my journaling blocks and “anchored” them with black pen outlining, which I used on the rest of my layout as well. 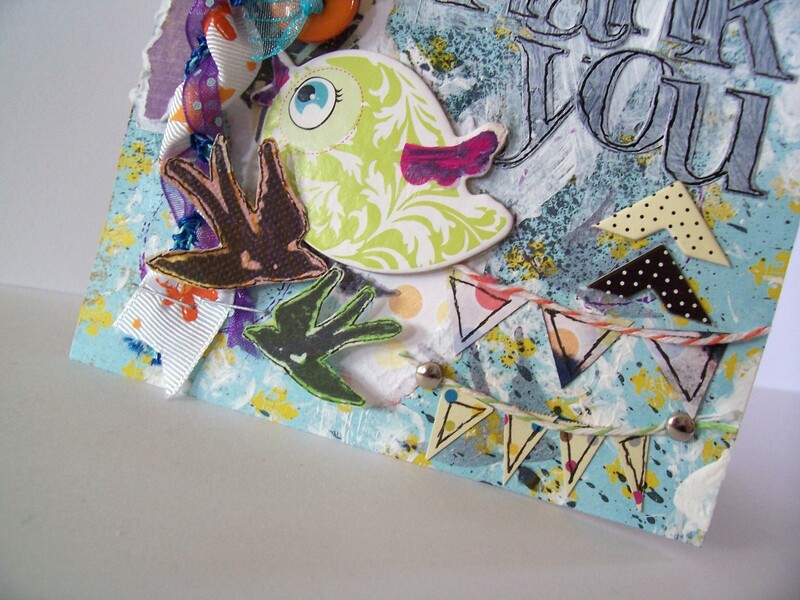 I also used two stamps from a Studio G set, “TO DO” and the arrow you see here. That’s a vellum frame from a prize won from a previous challenge. The title I made from some alpha tiles I’ve had forever, with the o’s (unplanned) covered in altered patterned paper and letter stickers from a newer sticker sheet. 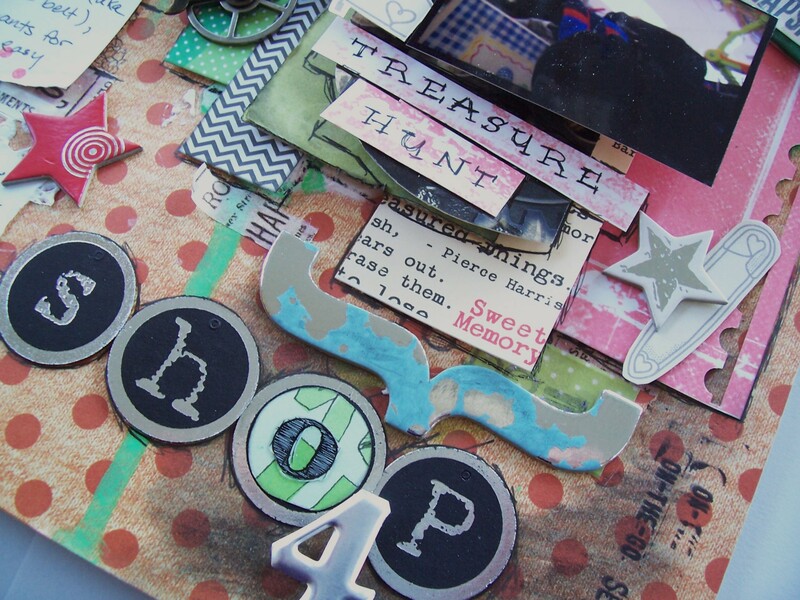 Some other stickers for “TO” and a Tim Holtz metal numeral “4” to finish off the title. And for the finishing touch, I used my Amy Tangerine roller stamp to random stamp on-the-go with the date in different spots. As you can see, I really built up the background layers and paper layers. Some of it unplanned, but I like how it turned out. …and saying thank you, with two new cards in my Etsy shop. I was playing with my messy stuff (i.e. gesso and spray ink), and decided it would make a nice card base. I also experimented with braiding ribbon. The title letters were adhered, gessoed over and then outlined in black pen. 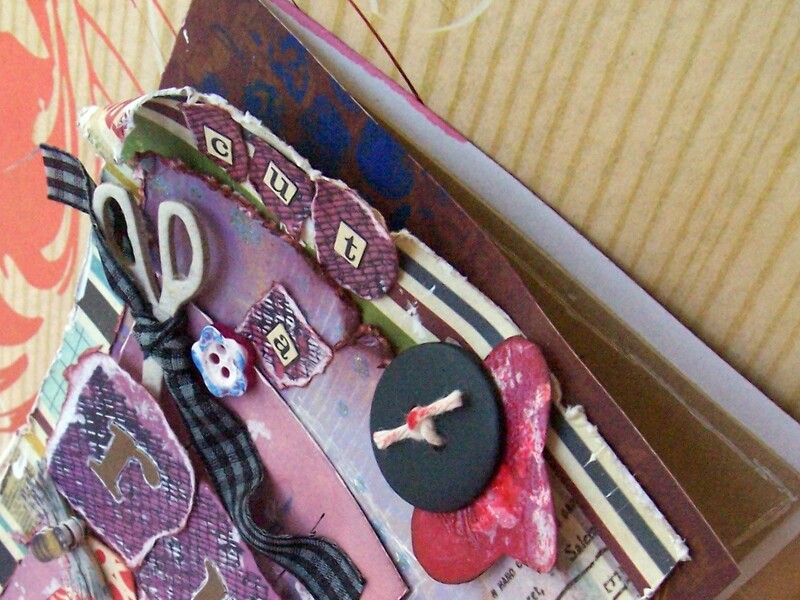 A card to celebrate, grunge style! I applied dark blue acrylic paint through my Heidi Swapp honeycomb stencil, then played with my stamps, Archival ink, sprays and paints. All of it resulted in this card. Really loving the distressed, grungy feel to this card. 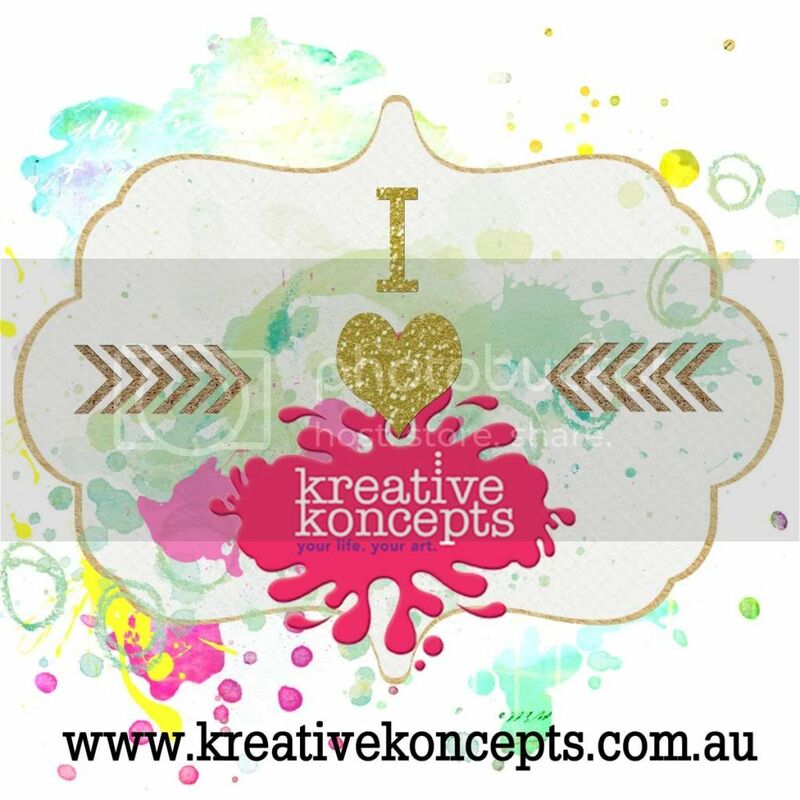 Hop on over to my Etsy shop to see them in all their glory!